Bridge inspection equipment must be able to provide access in the hardest-to-reach places. This multifunctional unit is capable of maneuvering around bridges in a way that is unlike any other machine. Additionally the ASPEN A-62 is equipped with some of the latest technical advances. It has a tremendous horizontal reach of 62 feet and requires no outriggers when operating. The Aspen A-62 is equipped with unique features such as a telescoping 4th boom and a 180 degree rotating platform. These features enable operators to easily get into tight areas behind deep beams. The Aspen A-62 is fitted with stabilizing systems which allow operators the advantage of being able to move the truck while the platform is deployed. A hydraulically sliding counterweight is installed under the truck so that the weight can be positioned in the most optimum counterbalanced position. A full color monitor is provided, at the pedestal, enabling operators to constantly monitor boom and turret movements. Bridge inspection equipment can be enhanced with the addition of advanced controls. As the most advanced microprocessor control system available, the “Plus 1” Graphical Terminal Interface includes a color display depicting unit operation and individual function performance while monitoring the unit’s parameters, hydraulics and enabling simple troubleshooting. Controls with wireless capabilities are included at both operator stations. A communication system is also provided with speakers in the cab, at the turntable, and in the platform. The platform station operates in the “hands-free” mode. Two rotating turntables plus multiple articulating and telescoping booms allow platform to deploy off of either side of the truck to access all of your structures. Turntable number two comes equipped with a leveling system, providing smooth platform movement. In addition, the operator can make manual adjustments of +/- 5 degrees to compensate for the super-elevation of the bridge. Without the requirement for leveling arms, the A-62 offers the latitude to clear fences up to 11 feet tall. 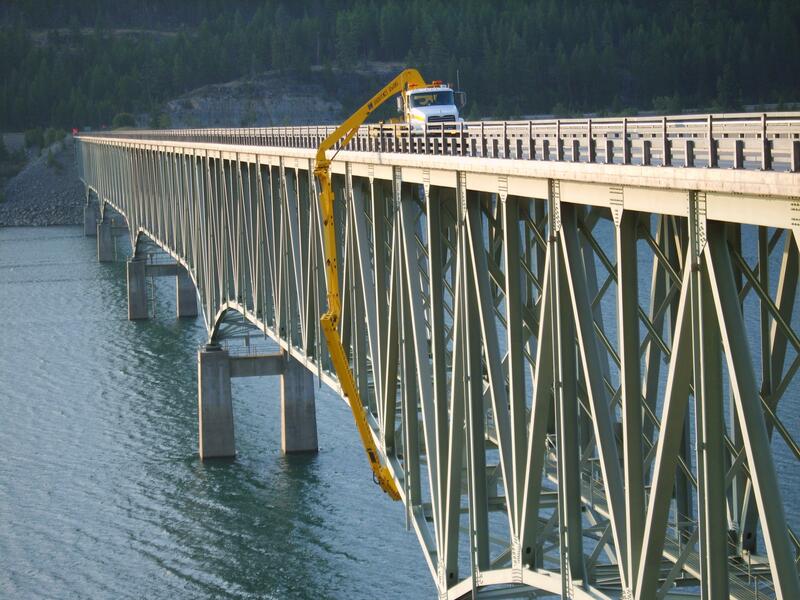 The Aspen A-62 has the capability of providing bridge inspectors with over 13′ of vertical reach through the use of its telescopic 4th boom section. This fully hydraulic feature will enable technicians to get up and behind the deepest girders for a close-up inspection. Bridge inspection often requires the added flexibility of a 180 degree rotating platform, which makes maneuvering into working positions significantly easier. This has the impact of increasing productivity and efficiency.